People around the world are fed with countless stories about Israel. I wonder how many of them are true. I have no statistics, however I do know that the international media commonly reports without showing the context, is guilty of purposely slanting stories, omitting details and even outright, blatant lies. From the comments people make about Israel it is obvious that many are misinformed and utterly ignorant of what it is really like here, who we are and how we behave. I think the most common media “sin” is not reporting or avoiding showing the human, real side of Israel. To them we are a war machine, not people. Watching the coverage (and the international reactions) of Operation Protective Edge, I kept thinking of this picture and what I wrote with it when I originally sent it to friends (Sept 2006). You will see from the below that the issue of improper media coverage is not new. The problem is that as the years go by, the narrative told about us is becoming more and more dangerous. The truth has not changed, you only have to look to see. To me this picture is a dramatic example of the problem. More specifically, the lack of publication of this type of picture is the problem. Have you ever seen pictures like this on tv? This picture reminds me of a scene from Operation Defensive Shield (2002). World media was screaming that the IDF had committed war crimes in Jenin (false allegations they later had to apologize for). I was following the Israeli news when amongst many other items I saw an Arab reporter interview a resident of Jenin. The interview was conducted in Arabic, there were Hebrew subtitles at the bottom of the screen so viewers like me could understand what the residents of Jenin had to say. 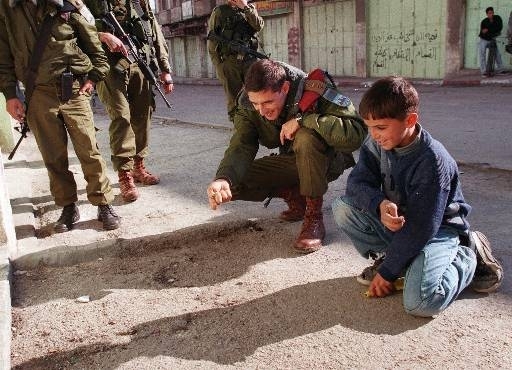 He had nothing to fear from the IDF because he wasn’t a terrorist. He knew that ONLY terrorists are targeted, that the ONLY time civilians are hurt is when there is an accident. Hamas also understands this, as do Hezbollah. That is why hiding behind human shields,storing weapons and attacking from mosques, schools, hospitals and clinics has become their modus operandi. They know who we are. How come people around the world don’t know who Israel is? Why don’t they know what Hamas is? Or Hezbollah? Do they have to behead American journalists for anyone to take note? Maybe then the media will change the way they cover Israel… Maybe. Reality in Israel is very different from what you are shown on your tv screens. Posted in 2014, Operation Protective EdgeTagged Gaza, Hamas, Hezbollah, human shield, IDF, Israel, Jenin, Operation Protective Edge, Paratrooper, reality, t.v.